Avon Rent a Car Truck and Van > Blog > EASY & SPOOKY DIY Halloween Decoration Ideas! Halloween is really the DIYer’s dream. Whether you’re into making costumes, baking, or decorating both inside or outside the house, there are almost endless numbers of projects to take on. 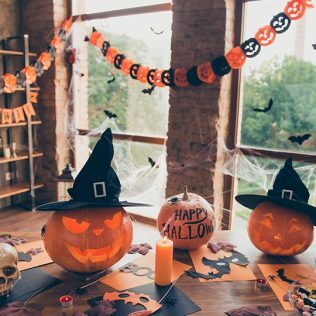 Whether you’re a DIY expert or novice, you’ll find plenty of décor ideas to make your home a little spookier. Here are a few you can do no matter your level of crafting experience. Halloween Banner: A Halloween banner can take many forms but the great news is that you can now pick up blank banners that are ready for customization at stores like Target, Walmart, and online. Find one you like and then create your own banner to hang inside during a party or on your front porch. You might come up with your own scary phrase, but “boo” and “trick or treat” never go out of style. Halloween Tree: A take on the Christmas tree, you can have a Halloween tree inside or outside. Pick a large tree in your yard and decorate it with plastic bats, glow in the dark skeletons, and more. For a fun indoor activity, pull out your Christmas tree and have fun turning it into a Halloween tree. The bonus here is that after October, you can take the decorations off and have a Thanksgiving tree before transitioning it into Christmas. DIY Ghost Family: This activity uses paper pull out bells that you see frequently at weddings and showers as the base for creating ghosts. Fold the bells out like normal, then drape them in cheese cloth and attach two black felt dots for eyes. You can create various sizes and they’re easy to hang in your yard or around the house. Creepy Living Room: Create the effect of a creepy, abandoned, living room for your Halloween party by draping your furniture in white sheets as though the home has been abandoned. Turn the lights down low or use candlelight to make it seem even more eerie. Bloody Candles: Bloody candles can make your home look creepy without much effort and go great with the creepy living room décor. Start with plain, white, pillar candles and have one red candle on hand. When the red candle wax begins to drip, allow it to drip down the sides of the white candles, to create a bloodied candle look. Sucker Candy Ghosts: For a quick way to cutesy up your Halloween candy (which doubles as décor), cut out square pieces of white fabric and use it to cover lollipops. Then tie a string around the base. Add eyes to make spooky ghosts out of your candy. Scary Soap: You can add a little Halloween spirit to your bathroom by creating scary soap. Start with a clear hand soap and drop in small plastic bats, skulls, or other decorations. There are so many ways to easily create fun Halloween décor for your home or office. Halloween is a fun time for the family and the perfect opportunity to get crafty. If you’re heading to a Halloween party, or trick or treating with a lot of kids this year, our 15 passenger vans are a GREAT way to get there!